Technology has truly changed and shaped the world as we know it. Cell phones were once seen as a luxury item, rather large and clunky to carry but a sign of status – after all, so few could afford to carry one. Today, however, nearly everyone is carrying the latest smartphone technology, the internet in the palm of their hands. But at what cost? We have become increasingly reliant upon the use of smartphone technology in our daily lives. These little devices are more than just a phone, they are our calculators, calendars, mp3 players, games systems, and more. The smallest questions that we face are met with the statement ‘I’ll Google that!’ before turning to our phones for internet access. They connect us to friends, family and loved ones on a global scale, and provide us with a welcome distraction when necessary. Recently, however, many experts have begun to question just how much time we spend staring at these little screens and the impact that it may have on our lives. Studies show that the average person will touch their cell phone an average of 2,617 times every single day. We’re unable to step away from these devices for even a moment, with 40% of people checking their phones while using the bathroom, and 1 in 10 taking it into the shower. Our addiction to our phones has run so deep, it has inspired the creation of the word ‘Nomophobia’. Defined as the fear of being without or unable to use your phone or smart device, this term describes the struggles of our modern society in a frighteningly accurate light. A large number of us today are literally addicted to our cell phones. A video has been making its way around the internet, having been uploaded to YouTube. Labeled as a ‘funny video’, it was obviously meant for entertainment purposes, but it may actually be so much more. 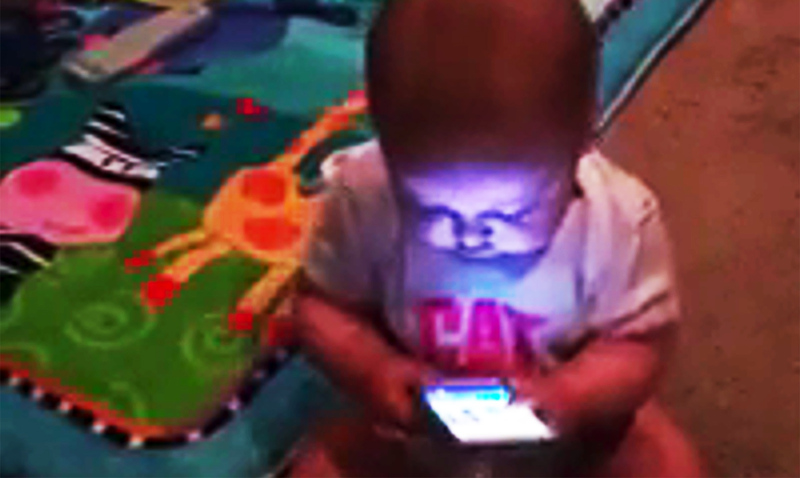 The video showed a young baby playing with a cell phone, it’s face illuminated from the light of the screen. During this time, he (or she) was happy and content, mesmerized by the device. However, as someone from off screen reaches over and takes the phone away, the baby breaks into complete hysterics, only to be calmed with the return of the device. It may appear to be nothing more than harmless fun, but the number of children presenting with cell phone addiction is rising. With scientists still unclear on the ways that these devices may influence brain development in children, are we being too ‘lax’ with screen time?